The buildings at 500 N. Liberty St., which once served as the Children’s Home of Delaware, opened its doors to victims of domestic violence recently. Turning Point is the first and only domestic violence shelter in Delaware County. 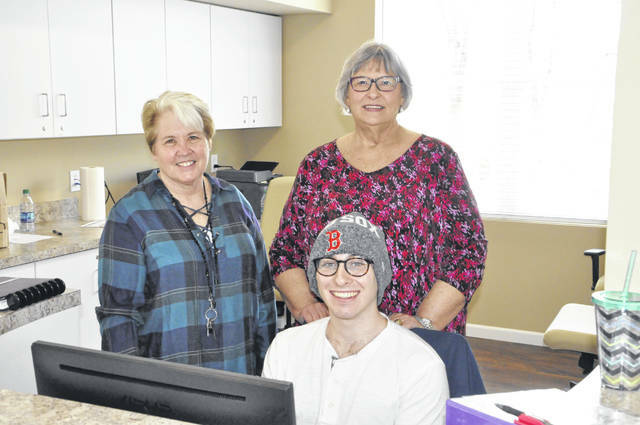 Pictured in the newly-constructed connector building at Turning Point Delaware are Shelter Director Kathy King (left), Turning Point Executive Director Paula Roller (right), and employee Maxwell Aaronson at the reception desk. Victims of domestic violence in Delaware County and surrounding communities now have a much-needed resource available to them. Turning Point, which is based and operates a shelter in Marion, began welcoming families into its second facility, located at 500 N. Liberty St. in Delaware, recently. Turning Point serves six counties — Delaware, Marion, Crawford, Morrow, Union and Wyandot — and has been a United Way agency in Delaware County for 40 years. However, with its continued growth, Delaware County has pressed the need for a second shelter. 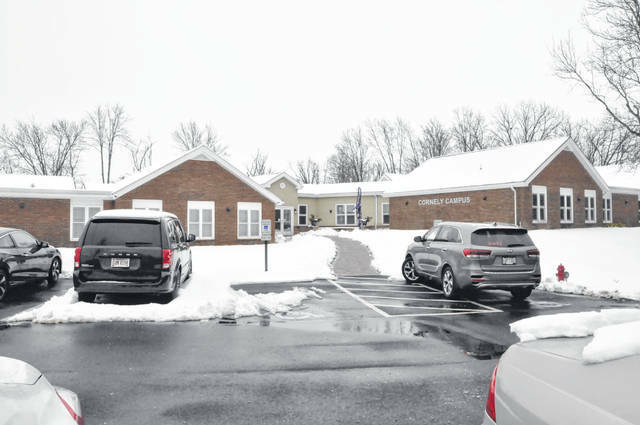 “Delaware has grown to be the largest county in Ohio without its own shelter, and obviously the largest in our six-county service area,” Turning Point Executive Director Paula Roller said. Turning Point purchased the land on Liberty Street, which once served as the Children’s Home of Delaware, in 2015 with the help of United Way of Delaware County and its Women’s Leadership Network. Renovations for the 13,000-square-foot facility totaled $3.2 million, which was raised through the organization’s capital campaign. In addition to renovating the two existing buildings, a middle connector of the two buildings was constructed to allow for only one entry point for the entire facility. That entry point is staffed 24/7 and includes monitors showing camera views all around the building. Roller stressed Turning Point Delaware is a safe house, meaning safety is of the highest priority. Every window and door is also fitted with an alarm that will sound should anyone attempt to open them. The Delaware facility has four full-time employees and “a pool of part-time people” that staff the shelter at all hours, Roller said. There are a total of 12 bedrooms, which range in size to accommodate varying family sizes. Roller estimates the facility can house around 42 people at any given time. Children are more than welcome, and the facility even features a large playroom full of toys and entertainment for the little ones, as well as an outdoor space and basketball court. Even pets will be accepted and housed in the facility’s kennel, which has separate spaces for cats and dogs. The kennel has outdoor space for pets and their owners to move around in the open air. Roller added the shelter will not discriminate, acknowledging there are all types of people who face abuse, including men, the elderly, and members of the LGBTQIAPK+ community. The shelter is meant to represent a community living space. Residents cook for themselves in a spacious community kitchen space, which features brand new appliances that were all donated by Whirlpool. Roller said it is not uncommon for the more skilled cooks staying at the shelter to cook for more than themselves or their own family. Often times, victims don’t have the ability to grab many — if any at all — of their belongings before leaving their struggle. Turning Point maintains a quality relationship with Goodwill to allow for residents to shop for free. Anyone who wishes to make clothing donations to Turning Point is asked to take them to Goodwill and make it known they are on behalf of Turning Point. Their “barn,” which sits just across the parking lot from the building, contains just about anything residents may need while staying, including the essential clothing items, personal hygiene products and bed items. There is also sectioned off cages that provide individual storage space for residents’ belongings they don’t wish to keep in their rooms. Roller said the average length of stay is typically around 70 days. Three of the rooms in the facility are designated for “transitional living.” They are meant for those who have been in shelter and need more time, perhaps while they finish school or to save up money for their own place. Those rooms include their own kitchen, dining room, and living room, and people may stay in those rooms for up to a year. “We will work with folks if that is beneficial to them, and they are making every effort to move forward and do what is necessary to live violence-free and support their family,” Roller said of the transitional living rooms. While Turning Point provides a place for people to escape the toxicity of their current situations, their services extend well beyond a bed and food. Both adult and children advocates are on hand to meet with and provide counseling for those staying at the shelter, and group sessions are held as well. Turning Point is funded through Delaware-Morrow Mental Health and Recovery Services, as well as federally through the Victims of Crime Assistance (VOCA) grant. Anyone interested in donating items to the shelter can bring them directly to the shelter. Turning Points asks that any donations be made during what would be considered normal business hours in accordance with their safety measures. To learn more about Turning Point, visit its website at www.turningpoint6.com or visit its Facebook page. The shelter’s list of needed donations is kept current on both outlets. Turning Point can be reached at 740-382-8988 or on its 24-hour hotline at 800-232-6505.